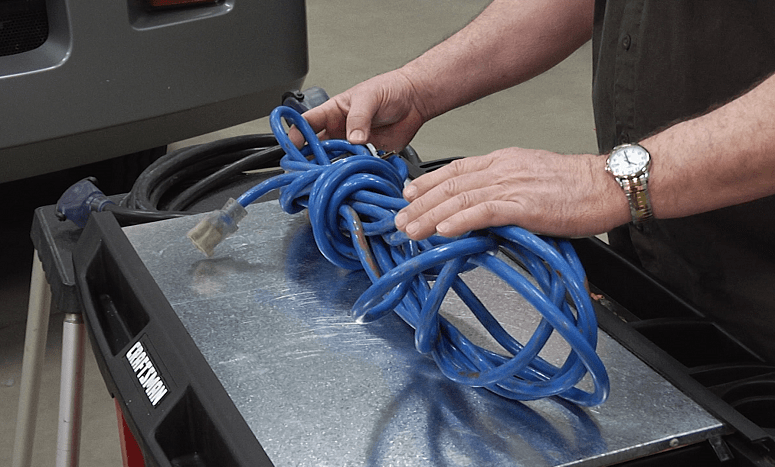 You’re never far from power with a quality cable.There’s a reason you can’t just bring any old power cord you get from Home Depot for the ride: we’re going to tell you why, and what you can do to prevent electrical disasters. 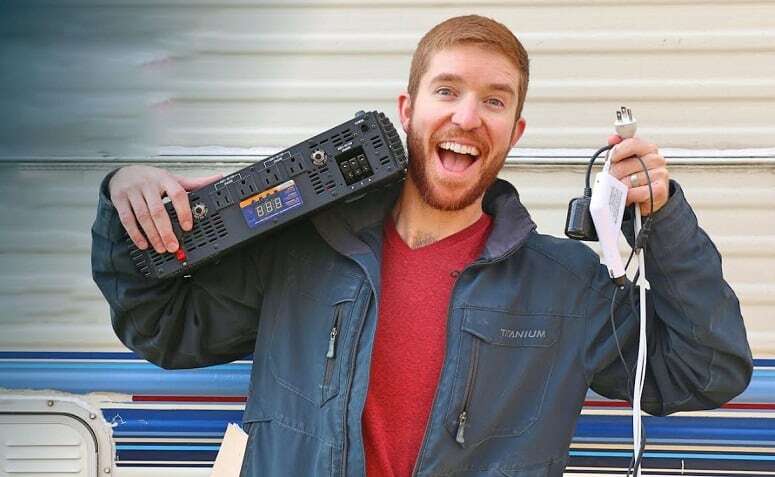 What Are RV Power Cords? How Long Of An RV Power Cord Do You Really Need? Between cost and durability, Conntek took the cake on this one. If you’ve never installed a new power cord on your RV before, the main problem we all run into is snipping the casing to expose enough wiring from within. Conntek took care of that inconvenience that used to technically shorten your overall power cord. You get a 6” ROJ extension to have some freedom with moving your wiring around, while still keeping the full twenty-five foot length. This cord runs 30 amps, and the durability of the plastic and rubber casing is poised to last for ages. The only difficulty with this cord is that the casing is so thick that maneuverability can take longer than expected. However, we’d take that over a short lifespan any day. The runner-up comes with a bit more power behind it. 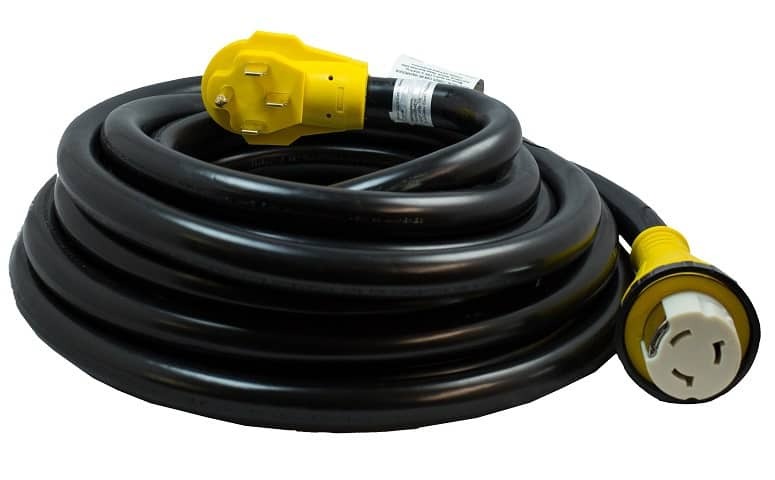 NJ-CORD provides a one-year warranty on their twenty-five foot extension cord (see guide below for distinction between extension cords versus cords). Apart from the agreeable price point, NJ-CORD offers a rigid plastic casing that retains shape even under extreme stress. You can transfer 50 amps of power when attached to your installed RV cord, providing power for your 125/250V system. NJ-CORD caught our eye for its versatility: users are adapting this to their Tesla cars, and the 1” diameter makes it extremely simple to store. Quite simply, this will last far beyond the warranty, extending your reach from your RV. Your RV trip could take you anywhere, and that means through winter conditions. Mophorn gives you flexibility and fast access in less than ideal conditions, working at lower temperatures without going too rigid or stiff. Keep in mind this is an extension cable designed to work with your installed system. You get fifty feet of length, 50 amps of power, though these are slightly less durable than other cords we’ve reviewed. The casing remains thinner to accommodate to harsher climates, which is why we recommend using this with extreme care. Mophorn also includes a one-year warranty, though numerous users report still having their Mophorn cable for five or more years. Pricing veers on the higher end, and if the average lifespan was any lower, it wouldn’t have made this list. Camco is a brand that needs no introduction, and they were still able to blow us away with this low-cost extension cable. 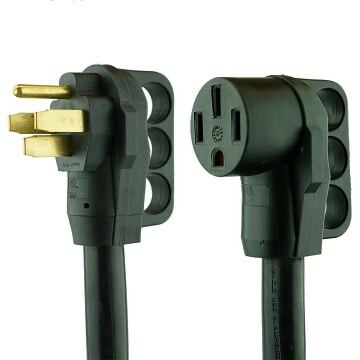 This cord either comes in a 30 or 50 design, numerous sizes, and gives you the option to include locks on the end caps or not. We’ve selected the twenty-five foot 30 model for its price, because after that, your wallet will start hurting a bit. Still, Camco’s dedication to quality can’t be ignored. This cable includes 100% copper wiring, unlike competitor brands which use a blend of different conductive materials. The plastic end caps have a feature we wish more brands would adapt, being the easy grip handle for a straight connection, and a simpler time when charging is over and it’s time to recoil the cable. This unit doesn’t support 2350 volt units. Last on our list, Happybuy sits in the middle of price and durability. You get a thick rubber casing containing 100% copper wiring. When you don’t add in filler conductivity elements, your cable lasts for far longer than the standard model they try to sell you at the RV outlet store. With a thick casing, this retains shape and stays rigid, but it is admittedly more difficult to use in colder environments. If you’re packing this with you for a winter trip, it’s doable, just a bit dodgy. 50 amps of power, sturdy end caps on the cord, and a generous thirty-six feet of cable to work with. Happybuy offers budget-conscious RVers an alternative solution that still comes with good length and a quality build. The only complaint we have about them relates to customer service: they’ll fulfill the warranty, but it is difficult to get ahold of them. It starts with the right cord, and ends with a list of do’s and don’ts that will keep you and your family safe, and utilizing your electricity at a far more efficient rate. If you’ve ever wondered what the main differences between different cord types are, we’re about to break it all down. We’ve covered the top RV power cords to make your next trip a bit easier. Are you still using the cord that came with your RV? Is it weathered, or are you just looking to lessen your time between recharge stops? Either way, you’ll be able to benefit from getting a new RV power cord. What we’re going to do here is differentiate between cords and extension cables, discuss amperage, and everything else that relates to your RV cord. It’s no simple task to just grab any cord and pray that it works; you need information to back it up. Your RV power cord often goes unnoticed. As time marches on, you need to replace and upgrade the system. We will go through every aspect of your RV power cable together, discuss what you need to know, and help you to be a better RV owner than you were yesterday. Your internal RV system (12V batteries) needs to charge like a phone battery. Well, we wish it were as simple as a USB cable. 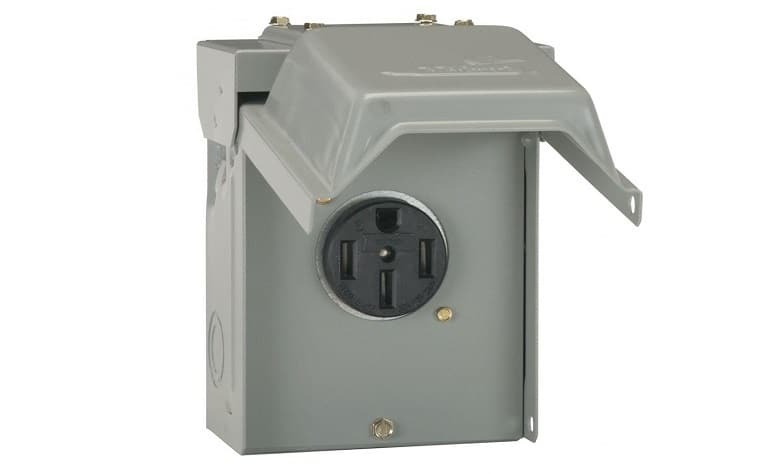 Your RV power cord runs through the exterior cap and connects in your electrical panel via three internal cords. This is where the difference between a power cord and an extension cord come into play, which we will get into a bit later. Let’s talk about what’s actually inside. With either plastic, PVC or rubber casing, electrical conductivity cables run throughout your cord and transfer electricity. The reason they’re encased in these materials is to stop the flow of electricity. One of the most common misconceptions that newer RV owners have is that there’s a higher quality option out there. There isn’t: these are the exterior materials that work, and keep you safe. However, the wiring is a different story. The best wiring you can possible get is 100% copper. Not only does it promote a faster flow of electricity (quicker charging times), but it’s safer when it comes to electrical surges. A surge might destroy your power cable, but copper is more equipped to handle out-of-boundary voltage and still work after the fact. Copper is also correlated to longer-lasting lifespans on RV power cords as well. Despite them seeming very similar, there’s a substantial difference between a cord you get at Home Depot, and an RV power cord. For one, a standard utility power cord isn’t going to work. When we say utility, we mean 120V cords for dryers and electric stoves. You’ll notice a common theme with many of the cords we’ve chosen: they handle 125V to 250V systems, which a standard cord cannot do. On top of that, the bare ends of these cables can’t properly fit into your RV. Even if you were to adapt them, it would be dangerous and likely to malfunction (not to mention that utility power cords are rarely available in sizes longer than ten feet). RV cords are designed to carry 30 or 50 amps of power at a time. While the male ends of the cords might look similar to what’s in your washroom right now, the internal wiring is designed differently as well. A standard utility cord can’t carry the same charge that an RV cable can, which means longer charging times. Again, you can’t hook these up to your RV in the first place. The goal of differentiating the two is so you can be more informed for future purchases. This is a simple mix-up that happens often. These simply extend from your installed power cord to give you further reach to outlets. You’ll be able to tell by the male and female ends. If it doesn’t have an area that directly connects into the power course on your RV, it’s an extension cord. In come cases, one end may look like it’s simply flat with no wires. That’s because it ships with the casing flush against the wiring, and you are expected to cut the casing to fit your needs. The only problem with this is that it technically reduces your cord’s length by the amount of casing you cut away. That’s why we made one of our choices, because of the 6” extension of additional cable. There are four main types of RV plugs that you’re going to see. You’ll need to consult your owner’s manual before deciding on which adapter and amperage is right for you. 30 amp plugs come with a triangular three-prong male end. These work specifically with 30 amp systems, and will not work with a 50 amp system. These cords output 3,600 watts of power, and usually work with smaller RVs (usually 21’ to 26’ models). They tend to be cheaper than 50 amp units partially due to mixed conductivity materials. 50 amp plugs come with a quadruple prong system. These work with your 50 amp RVs, usually on models that are 31’ or larger, and more commonly with newer RVs that have greater power consumption due to the growing number of embedded technological devices. You can run up to 12,000 watts, more than three times that of a 30 amp system. 50 amp cables are more expensive, and as a result, usually built with thicker casings and 100% copper wiring. Earlier we mentioned that 30 amp plugs can only be used with a 30 amp power unit, and the same rule applies to 50 amp units. That’s true, for bare cables and male ends, but you can get a dog bone adapter to make life a little easier. 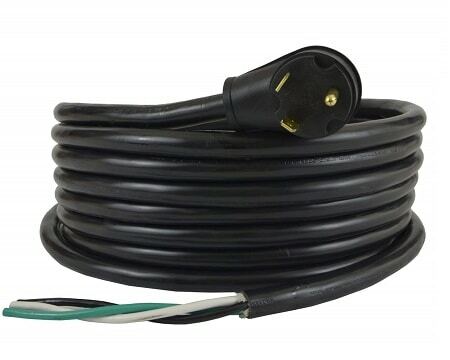 These 1’ to 6’ cables (average length of Camco models) operate on the simple fact that not every campground you go to is going to be accommodating to your RV type. Depending on what adapter you require, you can charge a 50 amp unit at a 30 amp station, and vice versa. This comes in handy during extended trips with intermittent stops. Dog bone adapters do come with an increased risk of surge and electrical shock due to the internal bypass system. This is not a product to cheap out on. Thankfully, they usually only run you between $10 and $20 for a quality one. Hockey puck adapters are simple, like dog bone adapters. While dog bones tend to have a 1’ to 6’ cord, hockey puck adapters are simple pieces with no cables whatsoever. You plug your cable into it, and you’ve got a few inches of plastic extending from the cord with a new male end. These are relatively inexpensive, but like dog bone adapters, make sure you opt for a decent brand and model. First of all, we’d like to state that these are not the same. A UL mark is not the light version of a C-UL mark. They are different, and have different purposes, which we’ll go over now. WHAT IS A UL APPROVAL RATING? These are approved by the Underwriters Laboratories for being safe for all outlets in the United States. A UL rating follows the electrical code known as ANSI/UL 484, which is an industry standard that is mostly used in air conditioner engineering. If your RV power cord has a UL stamp of approval, iit boasts the same reliability as a wall AC united cord. WHAT IS A C-UL APPROVAL RATING? A C-UL mark, also known as a cUL mark, is specified for Canadian markets. Though similar in title, these are issued by a non-American agency, the Canadian Standards Association, in compliance with the Canadian electrical code. This is a very important feature that can’t be overlooked: UL and C-UL are not the same. Back in the 80s, many full-time RVers needed 75’ to 100’ of cord length. This was because you had clustered charging stations in campgrounds, which were wildly inaccessible unless you happened to park extremely close to the edge. Nowadays, we have charging stations with a much more simplistic setup where RV drivers are able to get very close to charging stations. You might run into the occasional issue with older campgrounds, which is why we recommend getting a 25’ base cord and at least 5’ of extension. It takes up very little space, and doesn’t leave you without power if conditions aren’t ideal. There are a lot of guides on YouTube that tell you the exterior cap has to be replaced if you’re installing a new power cable. To install a new power cord in your RV, you need to turn off the power, and safely disconnect it from your RV’s electrical box. If your unit is older and you’re not quite certain where it is, consult your manual. If you still aren’t certain, have a second set of hands to tug on the cord from outside, and note any tightening in the electrical box. Simply unlock the three cables from their place, remove them from the slot, and have your second pair of hands pull the cord out. This might take some force depending on how tight the previous installation was. If it’s easier for you, you can always remove the cap and apply new adhesive to it after installing the new cable, but this is not always necessary. Run your cable through the conduit, ensure you’ve plugged them into the proper spots, lock the wires into place, and you’re good to go. Give the new cable a tug to ensure it’s not going to pull and damage your electrical box. There are a few aspects to keep a lookout for above all else. Minor gripes aside, the main features of your RV power cord or extension cable need to be on-point. You’re looking to run your RV as efficiently as possible, and minimize charge times. This is where you have to look at your power bank, amperage on items (like an RV TV, roof vents, etc. ), and determine how much power you’re running through. The more passengers, the faster you’re going to burn through that energy reserve. If you need to recharge from basically zero percent of your battery left, you’ll want a copper wire cord for faster charging. Is your system a 50 amp or a 30 amp? Are you using the full length of the cord, or do you find that there’s too much? This is the time to upgrade your base cord length and forego the expense of an extension cable. You’ll also want to look at the wiring. If you’re using a 100% copper wire, you’ll receive faster charge times. If you downgrade to a wiring system with less resilient conductive systems, then you’ll get a slower charge time, and inadvertently make your job a lot harder. Do you need to connect multiple times in a week? If you have a bit more time to plan and can visit charging stations that you can either view online, or you’ve been to before, then you can plan your route accordingly. 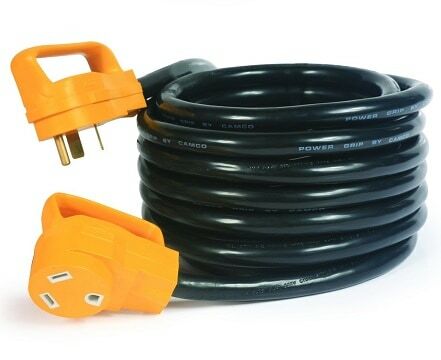 If you need to connect to a power grid often, you want a copper wire RV power cable, and preferably a 50 amp system for faster charging. While the latter is out of your control until you buy a new RV or upgrade your system, getting a high-quality cable can be a major time-saver. If you’re more of a driver-all-night kind of RVer and like to enjoy the scenery in the morning, you won’t have to worry about mass power consumption on the road. You can effectively travel, even with passengers, during the night to mitigate electrical use. If you’re travelling with the family, you’re going to run into more energy use. It’s also a good idea to note that if you’re camping during “tourist trap” season, you might have a longer wait to use a power charging station. Either that, or others might be parked in such a way that you need a longer cable. If you can only camp during busy times, consider having a total of 75’ to 125’ between your power cord and extension cable. We know that nobody is excited about long electrical charging wait times. Get more hours in on the road, make your RV versatile for every time of charging station, and get back to doing what you wanted in the first place: driving and camping in your RV like there’s no tomorrow.